This week I visited the studio of a great artist closer to home, the San Francisco atelier of my good friend Adrian Card. Adrian is one of those amazing fellows who is expert at so many esoteric things I can't help but wonder if he was transported here directly from the 17th Century. Or maybe he is possessed by the ghost of some Flemish harpsichord decorator, which would of course be a good thing if you had a harpsichord needing ornamenting, as this just happens to be Adrian Card's specialty. 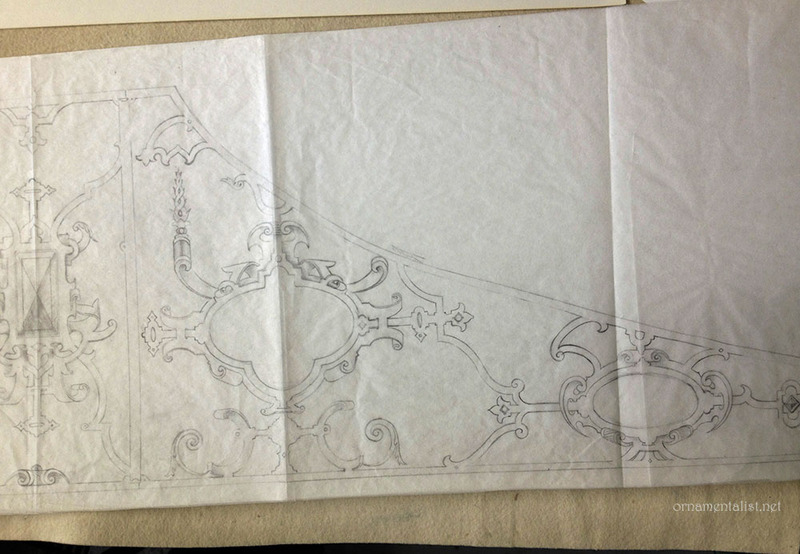 Adrian Card at his drafting table, designing Delft-style ornamentation for a guitar. Adrian comes from an old Dutch-American family: "My father's ancestors all came over here in the early 17th and 18th centuries, mostly of English and Dutch extraction. They settled in Northern New Jersey in the late 17th century after getting tired of the city life in Manhattan (New Amsterdam). My family has been in the same place ever since. My father was baptized in a church whose graveyard contains the remains of his ancestors who fought in the American Revolution - it's about 5 minutes from where my parents live now and where I grew up." 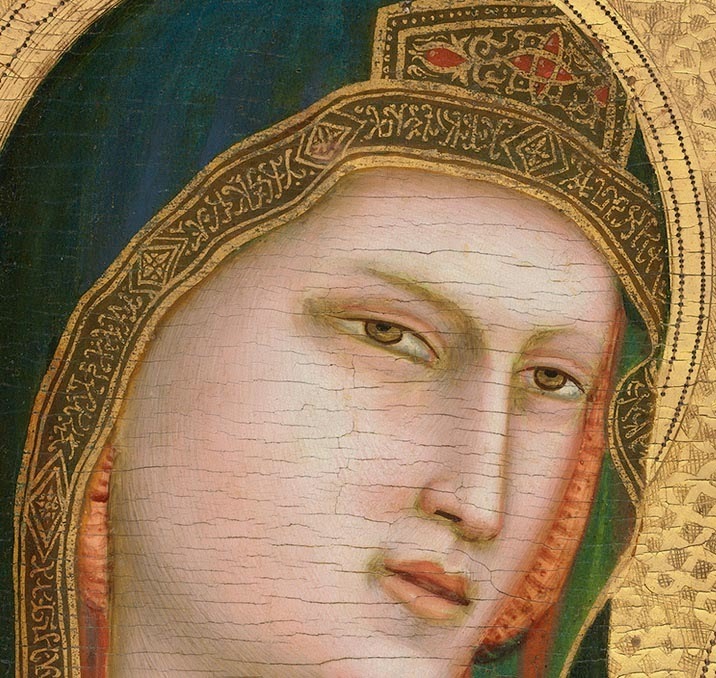 Adrian became fluent in Dutch, which he learned by and for studying antique books on painting techniques. 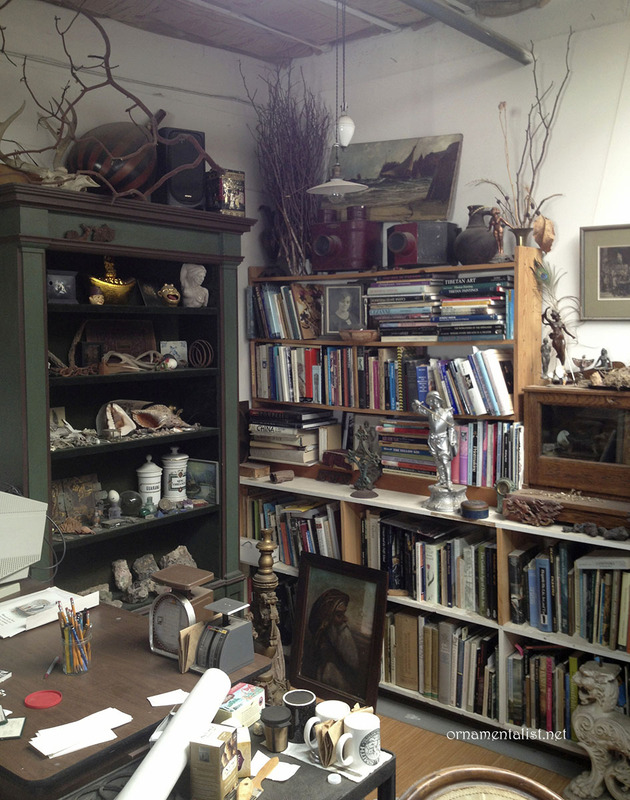 A corner of Adrian Card's Studio, filled with design books and inspiring what's-its. "I had been fascinated with 17th century Dutch painting since the 6th grade" Adrian says, "when an art teacher (aptly named Mrs. Farber) showed us slides of some Vermeer paintings... it was like an epiphany. I got interested in how they did it, and started to learn Dutch when I realized how much had been written about technique and whatnot in Dutch, that had never been translated into English." Not long after that Adrian painted his first harpsichord soundboard. 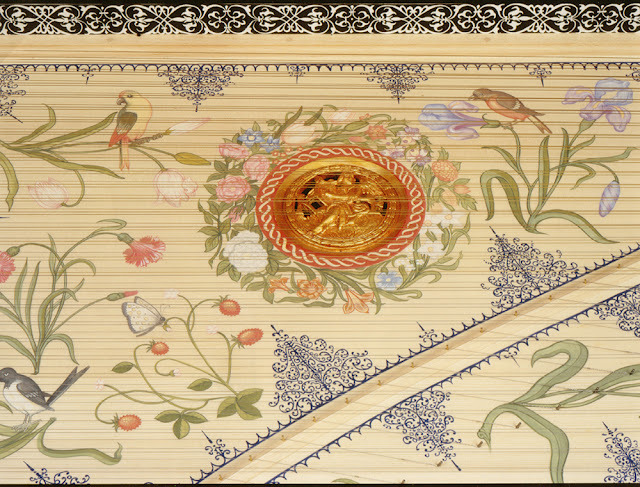 "Getting involved in harpsichord decoration only solidified my drive to learn Dutch." Adrian studied at the Philadelphia College of Art, and after a brief flirtation with the idea of going to the Hochschule Der Kunste in Berlin, he came to San Francisco where he earned a degree in printmaking at the San Francisco Art Institute. 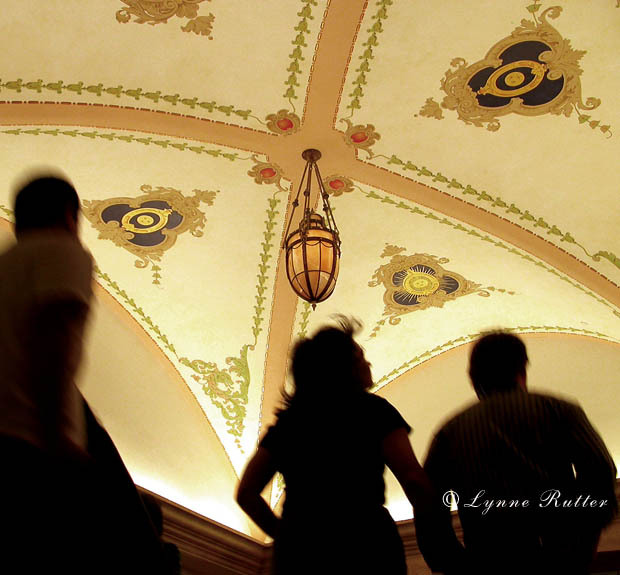 "I have long been fascinated with historic ornament. 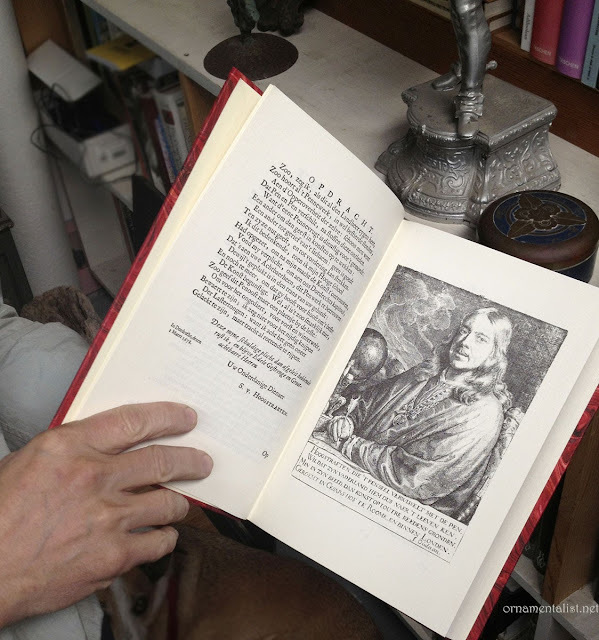 A fellow-student and friend at SFAI and I both shared a passion for ornamental borders, which was something we needed to keep to ourselves, or risk the ridicule of our neo-neo-neo-expressionist fellow students." 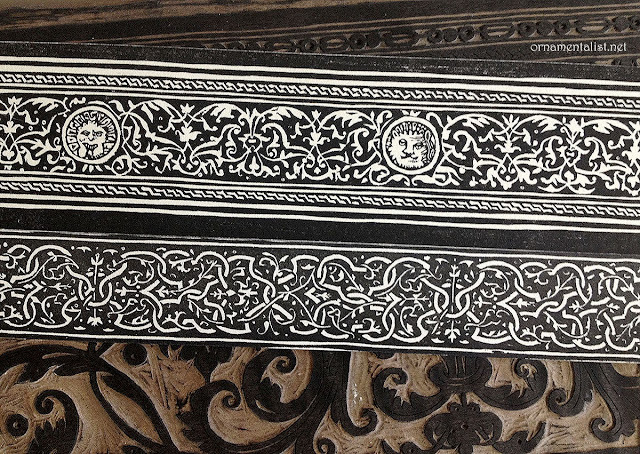 Historic woodblock-printed papers reproduced by Adrian Card for a harpsichord restoration. 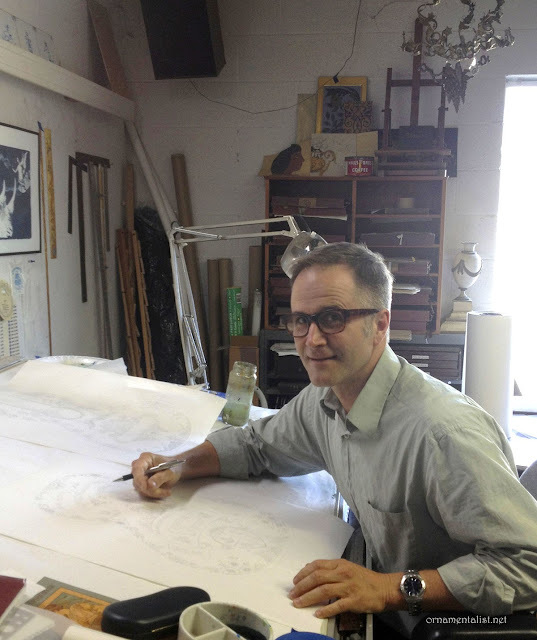 After graduating from SFAI, Adrian began to do some historic ornament work for a variety of applications, but when the opportunity to work for a prestigious animation company presented itself, he pursued it. He worked in animation for a number of years before returning to the world of ornament, starting his own business in 1999. 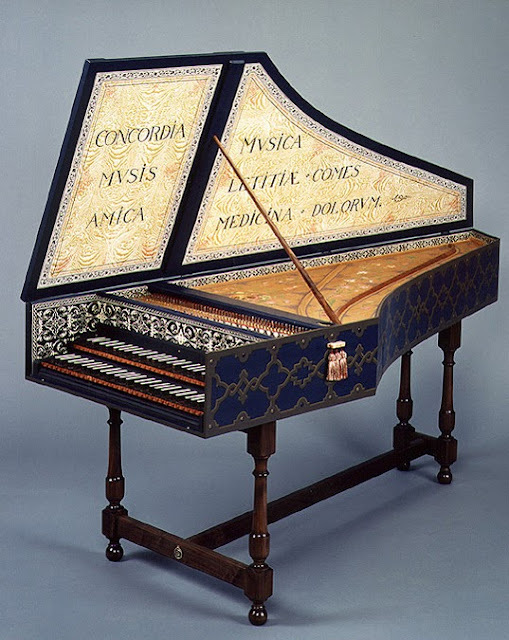 Adrian credits other harpsichord painters for helping him with his career: "... notably Janine Johnson and Sheridan Germann, who were generous with their time and knowledge, and instrument maker Kevin Fryer, who also taught me a lot." 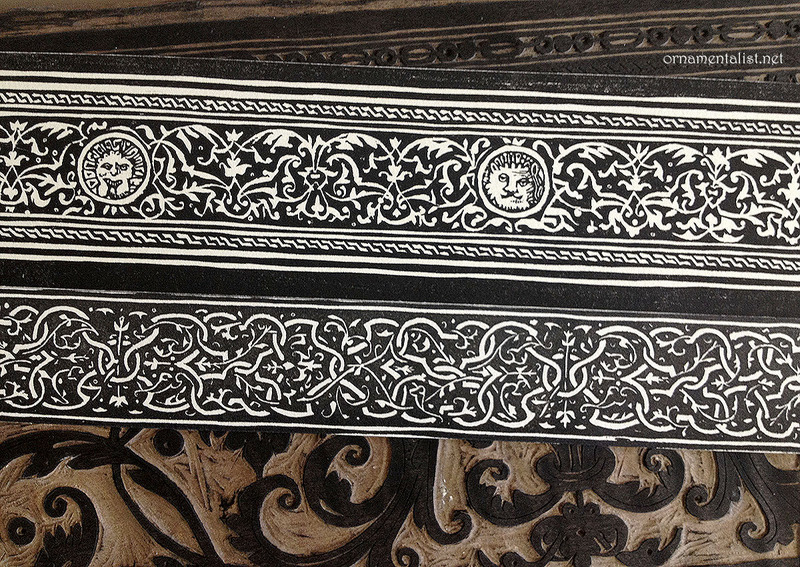 His printmaking skills have been useful for creating the hand-printed papers for Flemish harpsichords, "a practice that dates back to the 1500s, when they were employed as an inexpensive way to imitate the expensive Italian custom of ebony and ivory inlay work." 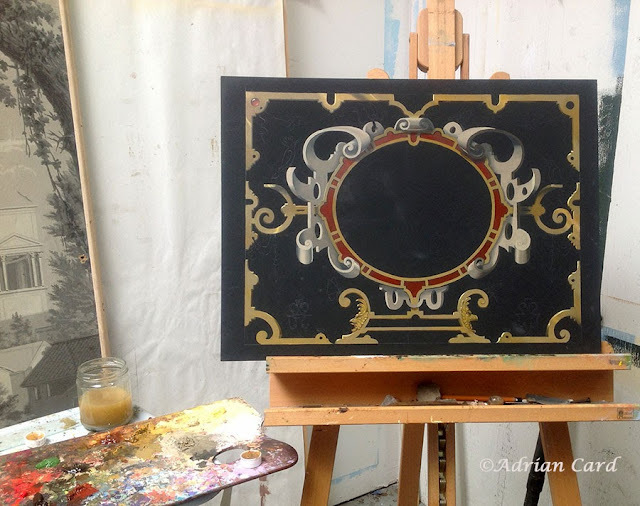 Skills used in harpsichord decoration are also applicable to furniture and murals, and Adrian has completed a number of fantastic commissions using historic ornament of many different periods and styles. 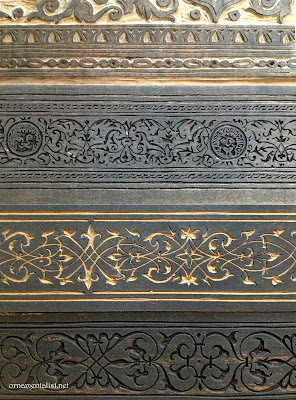 The soundboards of harpsichords (and other instruments) must be painted with particular water-based materials to preserve the sound of the instrument. 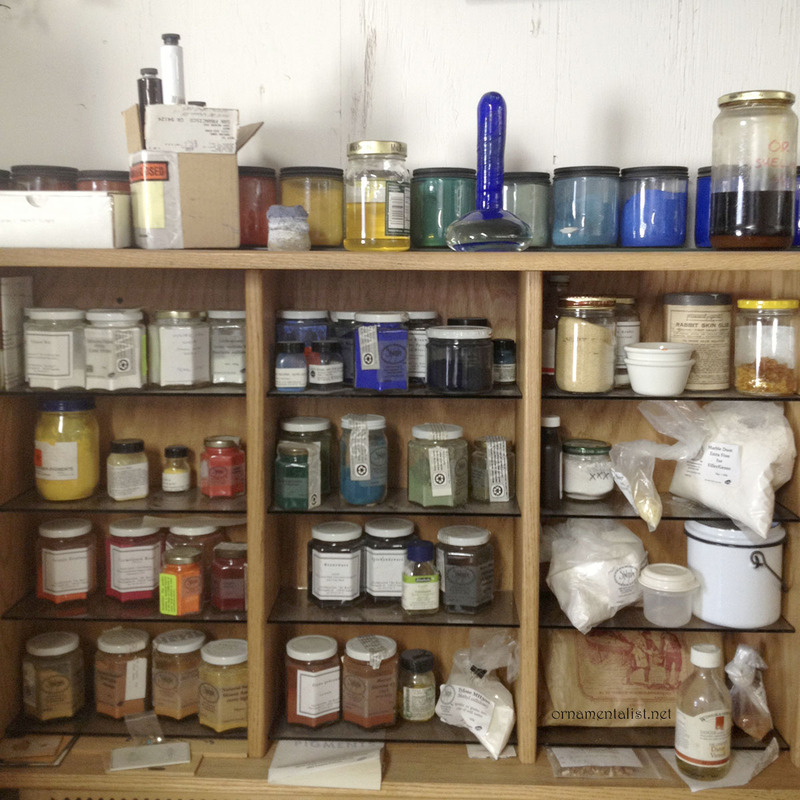 This means making the paint from raw pigments and materials using historic recipes. 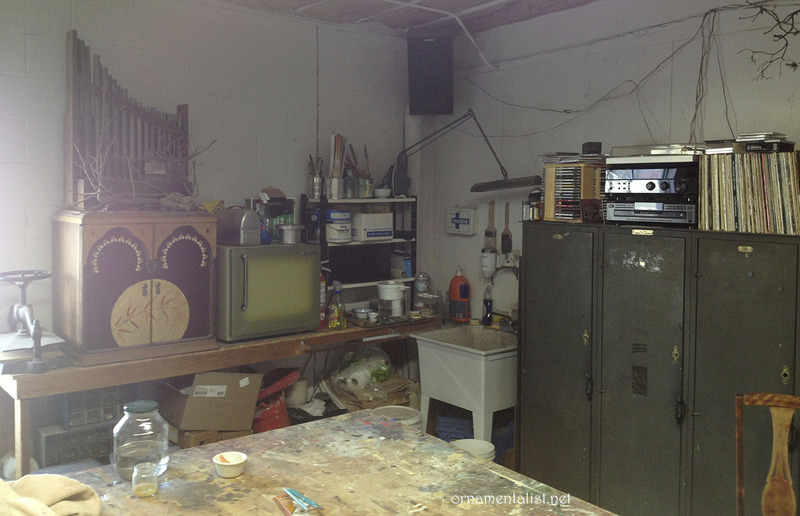 The studio is like a walk-in Wunderkammer, filled with inspiring objects, old broken things, old working things, drawers full of designs and past work, as well as collected bits of tiles, insects, minerals and wallpapers. I met Adrian Card some years ago when he joined my guild, Artistic License. We have since collaborated on some projects as as well as become great friends through our shared love of ornament, collecting, martinis, flea markets, books, and the search for the perfect Victorian light fixture. During a recent meeting several kindred spirits discussed which animal's urine had the strongest ammonia content needed for making bluest Verdigris pigment. Ok well, maybe you had to be there. 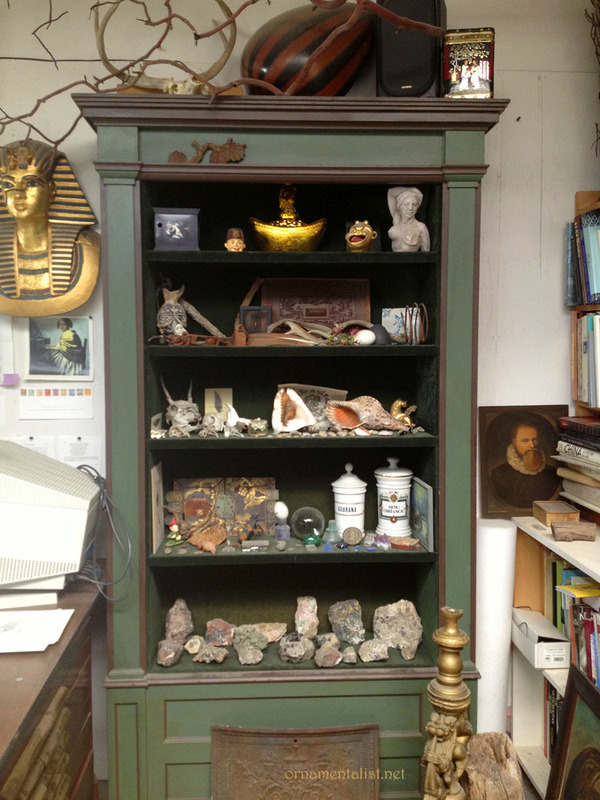 Adrian Card's studio Wunderkammer includes fluorescent rocks collected near his home town. 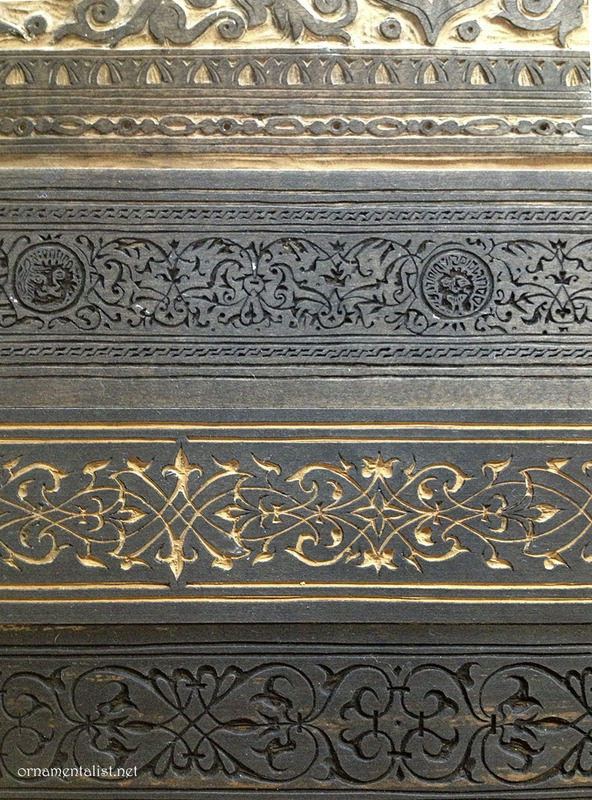 a favorite of Flemish designers and a great trompe l'oeil device for any number of uses. Limner is in the glossary! of course it is. love this entry. 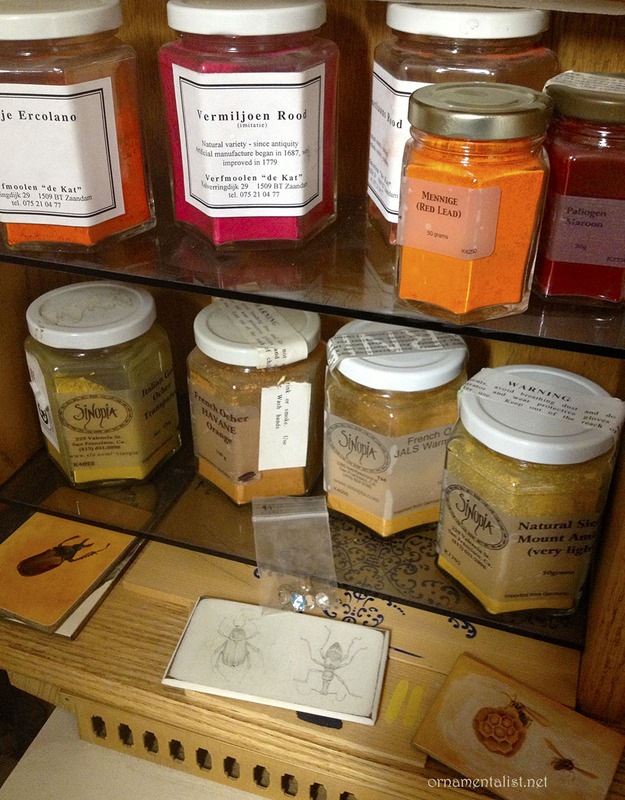 I especially like "which animal's urine had the strongest ammonia content needed for making bluest Verdigris pigment." What was the conclusion? Im guessing house cat? well cats were certainly mentioned but I think in the end we all agreed cats are not cooperative enough. I also love the cards. Looks very beautiful. It's so interesting that both you and Theresa have recently highlighted strapwork, as I incorporated some into a design recently without knowing the proper term for it. 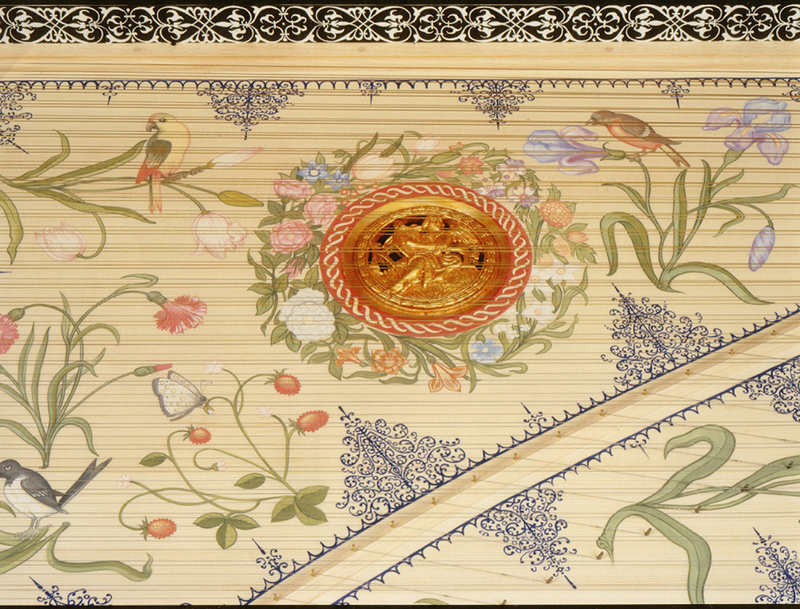 It's a treat to see the beautiful harpsicord decoration of Adrian Card, and to vicariously visit his studio. 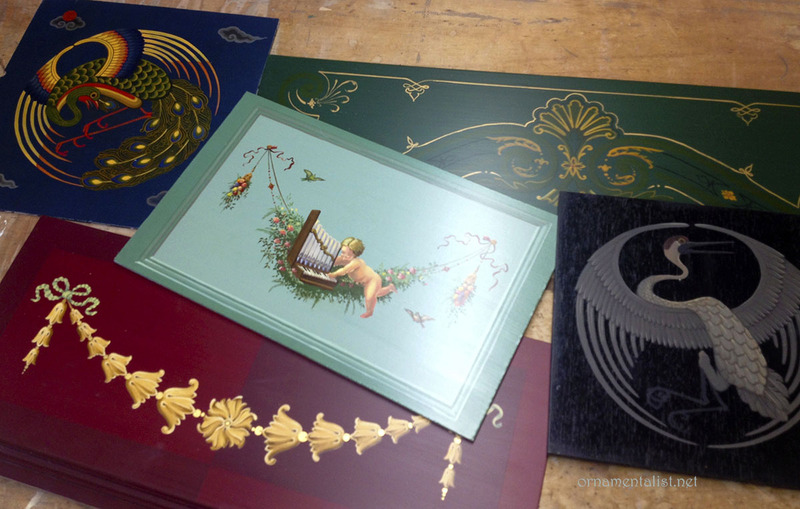 I like that design in progress and can imagine the jewel tones of the finished work. Thanks for a great post! Great pics! Really I like that so much. Keep sharing this stuff thanks.